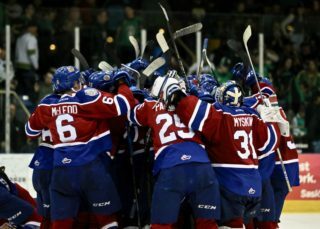 It looked like a game the Edmonton Oil Kings were fated to win, but that’s the thing about hockey; it’s not over till it’s over. Ryan Chyzowski tied the game for Medicine Hat with just 34 seconds left to play in regulation before James Hamblin scored the lone goal in the shootout as the host Tigers rallied to a 4-3 shootout win over the Oil Kings in front of 3,098 fans at the Canalta Centre on Wednesday night. 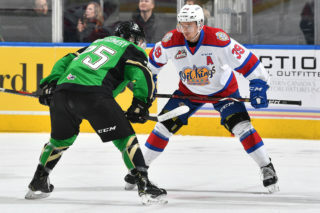 Early on it was all Oil Kings (24-14-4-4) as they outshot the Tigers (24-16-2-2), 16-6, in the first period of play, and 24-13 through 40 minutes. Edmonton owned a 2-1 lead with less than five minutes left to play in the third period. 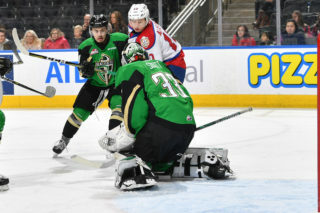 But despite the loss, the Oil Kings earned at least a point in their fourth straight game (3-0-0-1) and maintain first place in the Central Division with 56 points. The logjam continues atop the division, with the Lethbridge Hurricanes trailing at 54 points in second spot, followed by the Red Deer Rebels (53) and Tigers with 52. 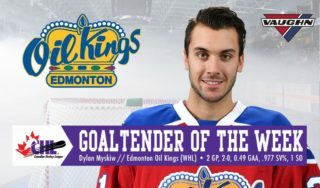 Dylan Myskiw (17-9-2-3) had an excellent showing in goal for the Oil Kings – which included a pair of point blank saves in overtime – but was handed the loss, surrendering three goals on 28 shots in regulation and overtime, before allowing the single goal in the shootout. Mads Sogaard was the starter for the Tigers, but left the game after falling awkwardly in his crease following a collision with a Medicine Hat defenceman at 14:44 of the second period. He was replaced by Jordan Hollett (12-12-0-0) who earned the win, turning aside 12 of 13 shots he faced. At the onset, it was the last line of defence that provided all the offence for Edmonton, as Ethan Cap gave the Oil Kings a 1-0 lead with his fifth of the season, from Vladimir Alistrov and Wyatt McLeod, at 5:19 of the opening frame. Just over five minutes later the Tigers made it a 1-1 game, but with a faceoff in the offensive zone with just six seconds remaining in the period, birthday boy Liam Keeler won the faceoff back to Wyatt McLeod who put Edmonton up, 2-1, with just three seconds left on the clock. In the second period, the Tigers once again managed to tie the game at 4:35, but with the power play, the Oil Kings had plenty of reason to celebrate. 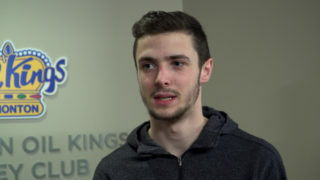 Newly acquired Josh Williams scored his first goal as a member of the Oil Kings – against his former team no less – to once again give Edmonton the edge, 3-2, from Trey Fix-Wolansky and Vince Loschiavo at 12:45, which is how the game would remain until the final minute of regulation. With just 34 seconds left to play, Chyzowski’s 15th of the season sent the game to extra time, which eventually ended with the Tigers shootout win. Hamblin (Goal), Linus Nassen (X) and Jevne (X) went to the line for the Tigers who shot first, while Vladimir Alistrov (X), Williams (X) and Fix-Wolansky (X) each shot for the Oil Kings. The assist by Fix-Wolansky (76) inched him closer to the WHL scoring lead, as he trails Portland Winterhawks’ Joachim Blichfeld (79) by just three points. Medicine Hat was 0-for-1 on the power play while Edmonton finished the night going a pristine 1-for-1 with the man advantage. Wyatt McLeod (EDM) (3), Corson Hopwo (MH) (2), and Jordan Hollett (MH) (1) were selected as the Three Stars of the Game. The Oil Kings are back in action on Saturday, January 19 when the Oil Kings host the Calgary Hitmen at 1:30 PM MT for the team’s second annual RE/MAX presents: WHL Suits Up with Don Cherry to Promote Organ Donation game. The game serves as the first half of a Battle of Alberta doubleheader at Rogers Place which afterwards sees the Edmonton Oilers host the Calgary Flames at 8:00 PM MT. 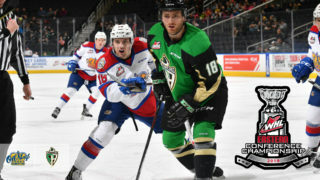 The Oil Kings will don commemorative Don Cherry-inspired jerseys which will be silent auctioned during the game with proceeds supporting the Kidney Foundation of Canada. Great seats are still available for all Edmonton Oil Kings home games during the 2018-19 season – including the WHL Suits Up with Don Cherry game – starting at just $20. Visit OilKings.ca for more information or to purchase.